I would like to congratulate the British Colombia council in the WLCU for their part in producing the Lebanese Emigrant stamp which commemorates the Lebanese emigrants as a whole, using the image of a statue originally conceived and produced in Mexico. 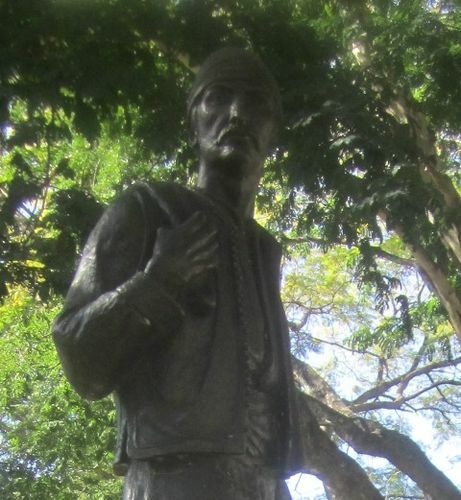 This gave me the opportunity to share with you this particular project about placing copies of the Statue of the Emigrante Libanes in cities around the world where Lebanese communities exist and wish to honor their ancestors. This project has been promoted by Centro Libanes of Mexico and I have had the opportunity to collaborate for a few years now. In 1880, the first group of Lebanese emigrant disembarked in the Port of Veracruz in Mexico. Those emigrants, as well as all other Lebanese emigrants around the world, were kind, polite and hard working people. These special qualities, as well as their moral values and, of course, their delicious gastronomy, helped them to open the doors of any shore they disembarked. Today, many of the sons and grandsons of those first emigrants are successful and prominent citizens everywhere in the world. The first emigrants received and helped the new emigrants; they prospered in commerce and then ventured in industries. Later on many had the opportunity to go to the university and became doctors, lawyers, accountants, etc. who work for their communities. Those first emigrants, taught their children and grandchildren not only their traditions and moral values, but also to love, honor and respect the nations that so generously received them, without ever forgetting their beloved Lebanon. After more than 130 years of Lebanese presence in Mexico, we can find Lebanese descendants in almost every corner of this country and many of them have become well known, successful and prominent citizens. As the Lebanese Community settled in Mexico, it started to organize itself around different associations, clubs and Lebanese Houses, emphasizing the one located in Mexico City, inaugurated in 1962 by President Adolfo López Mateos, who pronounced the famous phrase “IF YOU DON’T HAVE A LEBANESE FRIEND, YOU SHOULD FIND ONE”. In 1979, twelve years after the inauguration of Centro Libanes, the Board of Directors asked Mr. Ramis Barquet, a Mexican artist with Lebanese blood, to design a monument that would represent and honor the first emigrants. He created the beautiful statue we all know and which was placed in the main garden of Centro Libanes during a very touching ceremony. Shortly after that, Centro Libanes registered worldwide the intellectual property rights of the statue. We were ready to authorize other clubs and associations in different states of the Mexican Republic placing copies of the symbol. Centro Libanes decides not to charge any money for the use of the image of the statue (the only requirement is until now an special authorization) and encourage the communities to order copies: now you can find, besides those in the Capital City, copies in Puebla, Chihuahua, Merida, Coatzacoalcos, Veracruz, Guadalajara, Saltillo, and the list is growing. The image of the statue has a profound and enormous value in all of us, because it reflects our origin and background, of which we are very proud and because it represents our ancestors. As you can see his face is clearly Lebanese. Here in Mexico, we have presented reproductions of the statue as a gift to all the Presidents, Governors, Mayors and several distinguished sport, social, cultural and business personalities that have visited Centro Libanes through the years. In the year 2003, we thought it was time to honor the emigrants precisely in the place where they departed to the entire world. With this in mind, we ordered a monumental replica of the statue, four and a half meters tall, and 1.5 tons of weight. 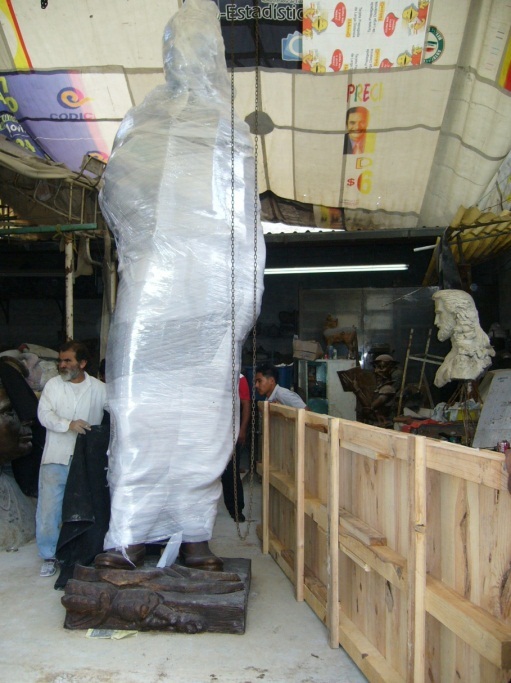 The project was well received by the Lebanese authorities as well as the City of Beirut, and after few weeks of journey the statue finally arrived to the Port of Beirut and then immediately transported to its present location in the area of Marfac (the port) Avenue Charles Helou. The opening ceremony took place on October the fifth 2003. During 2005, I had the honor to serve as President of Centro Libanes. It was a great experience and we decided to dedicate the year to a very special celebration: one hundred and twenty five years of Lebanese presence in Mexico. Several events and ceremonies were organized in honor of such anniversary. For the first time in the world, the Mexican Post Office authorized the printing of a stamp with the image of the Emigrante Libanes and the Cedars Of Lebanon. The authorization to use the stamp was granted by the President of the Mexican Republic Vicente Fox in a special ceremony hosted by Centro Libanes. At the same time, the Mexican National Lottery stated they also wanted to honor our fathers and grandfathers and decided to print the ticket of the last raffle of the month of November, of course with the image of a Cedar of Lebanon and the image of the Emigrante Libanes. The final event of these celebrations in honor of our ancestors, took place a few blocks away from the Centro Libanes. We were able to get the authorization of the Government of Mexico City to place a monumental replica of the statue in one of the most important avenues called Avenida Insurgentes. Among other personalities, the unveiling ceremony was attended by the Mayor of Mexico City, and the Ambassador of Lebanon in Mexico (Mr. Nouhad Mahmoud) who has always been with us encouraging this project. By that time, we believed that after placing the statue in Beirut, (the port of departure), it was necessary to have a statue in Veracruz, (the port of arrival), only this time it would also include a memorial with the names of our beloved emigrants engraved in marble. In this project we wanted to involve all the members of our community. We didn’t want it to be made by a sole organization. For this purpose we designed a website in which everybody could register the names of the members of their family which are now and forever engraved in the memorial. 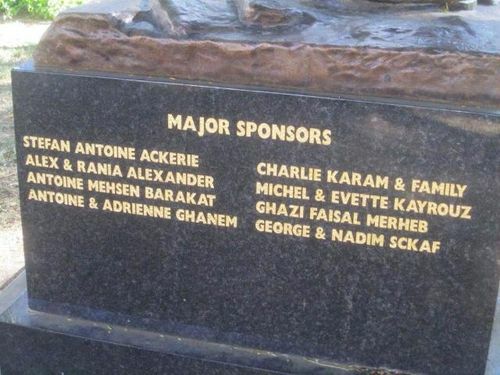 Through the same website everybody contributed with a donation for the construction of the monument. The community was very pleased with this project and we had a wonderful response. Resulting in the inscription of almost 500 names of true heroes, the emigrants, to whom we owe our presence here and now. Mexican Lebanese Architects Association, in collaboration with Centro Libanes of Veracruz was in charge of the design of the monument and memorial, and after a lot of work it was finally inaugurated in December 2007 in an emotional and touching ceremony honored with the presence of the Governor of the State of Veracruz, the Ambassador of Lebanon in Mexico, our Religious Authorities and the Presidents of Mexico and Veracruz Lebanese Clubs, and of course, a large number of members of our community who came from all the States of Mexico to celebrate this beautiful day. 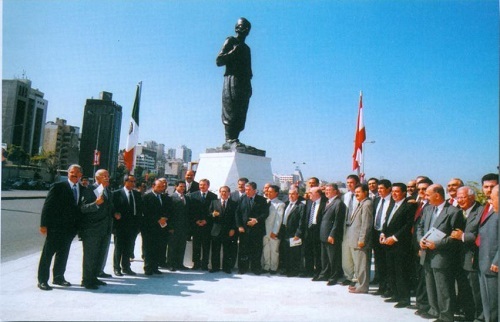 One of the most special and touching moments of the celebration was that at the same time, a group of persons leaded by the Mexican Ambassador in Lebanon were at the statue in Beirut remembering those emigrants who left Lebanon and arrive to Veracruz. 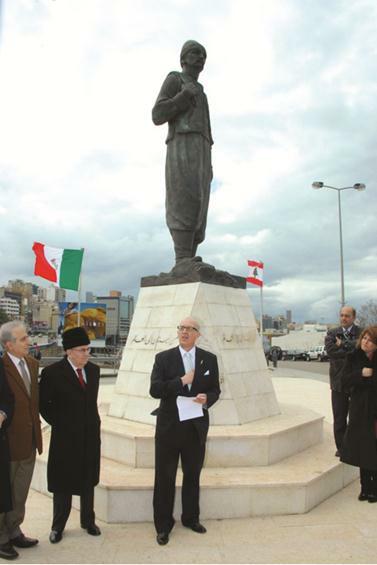 In November 17, 2007,at Centro Libanes Dr. Nick Kahwaji informed me that he moved a motion during the World Council Meeting of the WLCU to adopt the statue of the “Emigrante Libanes” as a prototype of the Lebanese emigrant. The motion was voted unanimously. 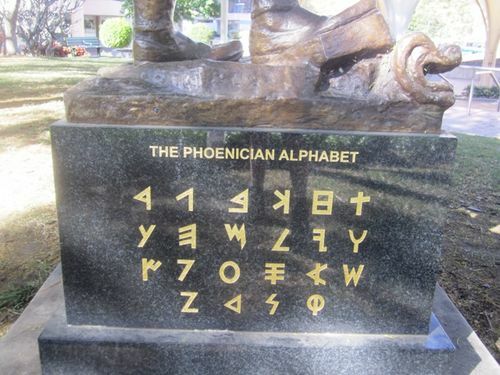 Few months later, we received an exciting e-mail from Dr. Nick Kahwaji, stating that the Lebanese Community in British Columbia wanted to honor their ancestors, by placing a copy of the statue in the city of Victoria. The event was sponsored by the Victoria chapter of WLCU. We made all the arrangements and the statue was inaugurated in June 14 of 2009 and we were informed that will be moved to this beautiful location on Victoria’s Island where it will be seen and appreciated by 3 million visitors every year. The journey of the Emigrant Statue continues. 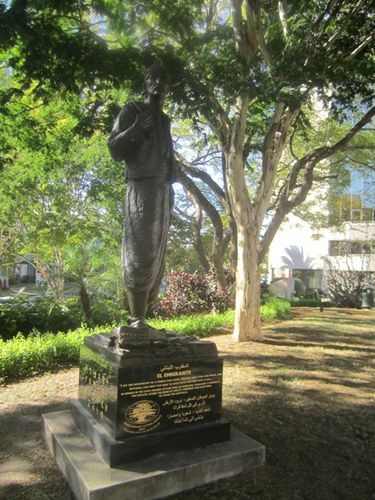 Some time later we received another joyful notice: The Community of Queensland in Australia, through Mr. Antoine Ghanem (Chairman, of The Culture & Heritage Affairs Committee WLCU) informed of his intention to erect a copy of the statue in the city of Brisbane, Australia. 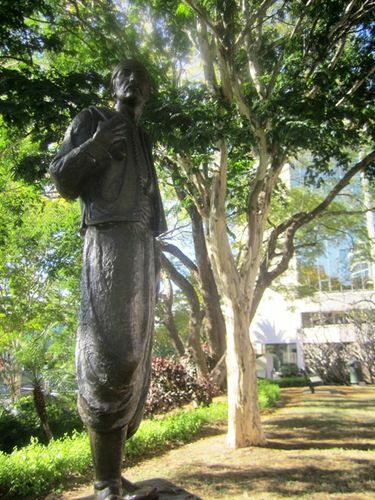 After several phone calls and e-mails the statue of EL Emigrante Libanes was shipped to Brisbane. 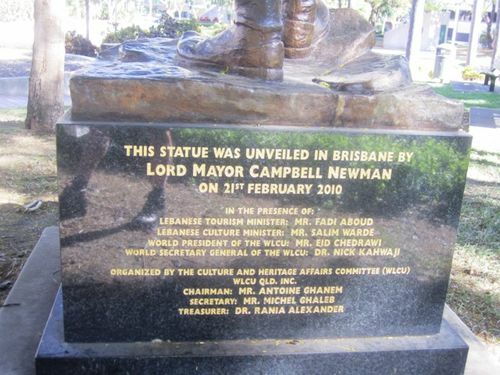 The unveiling ceremony took place 20 Feb 2010 in the presence of the Lord Mayor of Brisbane, representatives of the Premier of Queensland and the Prime Minister of Australia, Lebanese Ambassador and two Lebanese Ministers: Fadi Abboud and Salim Warde. One year later, we received another call from Mr. Antoine Ghanem asking us to prepare a statue for the city of Melbourne. 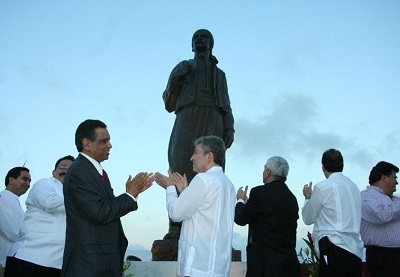 The Statue was inaugurated in Nov 2011 in a ceremony attended by Lebanese Ambassador, Lebanese Minister Walid Daouk and Australian and Lebanese dignitaries. We were informed last year that Antoine Ghanem was working on preparing two cities to adopt the statue: Ottawa in Canada, and Sydney in Australia. Besides the efforts that has been done, which is going to be the next community to honor those who gave us identity? I invite you to express the pride we feel for our roots and background, by placing copies of this monument all over the world, and organizing special ceremonies every second Sunday of March, the day dedicated by the Lebanese Government to the emigrants. I heard that Vancouver BC is celebrating this event. The size of the statue is not important, but the importance is that what we made this monument a Universal Symbol of a Proud, Strong and Globally United Lebanese Brotherhood.